Joseph Haim Brenner (Yossef Chaim Brenner, Joseph Chaim Brenner) was a Hebrew author and Zionist pioneer. He was born on September 11, 1881, in Novo Mliny, Ukraine. Brenner received a traditional education in a Yeshiva in Pochep for a few years, but soon moved away from religion. He first joined the Bund in 1898 and later became a Zionist. His first story, Paht Lechem ("A Loaf of Bread") was published in HaMelitz, a Hebrew language newspaper, in 1900, followed by a collection of short stories in 1901. In 1902, Joseph Chaim Brenner was drafted into the Russian army. Two years later, when the Russo-Japanese War broke out, he deserted, and eventually managed to escape to London with the help of the Bund. In London, he lived in a miserable Whitechapel apartment that was also the office of HaMe'orer, a Hebrew periodical that he edited and published in 1906-1907 together with Yehoshua Radler Feldman. Yosef Haim Brenner eked out a living as a typesetter, and observed the poor Jewish immigrants who were suffering in sweatshops. He became convinced that immigration from Russia to another Diaspora destination for Jews was simply exchanging one sort of hell for another, and his class consciousness increased. After a brief stay in Lemberg and Lwow, in 1909 Brenner came on Aliya to Turkish Palestine as part of the Second Aliya and tried to work in agriculture, following the example of Gordon, Aaron David (A.D.). His body was not up to the work and he left, or forced to leave, within about a week. Thereafter he worked as a translator, author and Hebrew teacher. From 1911, he moved to Jerusalem for a period, where most of his essays were published in Achdut, the weekly periodical of Poalei Tziyon. During World War I, the Ottoman Turkish government persecuted foreign nationals, especially Russians, and anti-Jewish riots broke out in Yaffo and Tel-Aviv, causing Brenner to move to Hadera for a while. He returned to Yaffo when the British conquered Palestine. In addition to his original works in Hebrew and Yiddish, Brenner translated Crime and Punishment by Dostoyevsky, as well as works by Tolstoy and works in German, Brenner was the most prominent literary figure in Eretz Israel in his day, and was responsible for moving the center of Hebrew literary activities away from Europe. Brenner was a critical and pessimistic figure, which perhaps made him all the more important and lent depth to the Zionist and Labor Zionist intellectual movement. His themes prefigure existentialist pessimism and nihilism. His first novel, Ba-Horef (in Winter) ends with the autobiographical hero, Feierman is forced to get off a train because he has no ticket. He is left stranded near a snow covered road in a forlorn place. The protagonists of his novels and stories all tend to share the same fate: aborted beginnings, unrealized hopes and goals, and bitterness and frustration. His first novel about Palestine, Mi-Kan Umi Kan (from Here and There) features Arieh Lapidot, a hero in the image of A.D. Gordon, who, together with his grandson, collect thorns for a fire to bake bread. "The old man and the youth were both crowned by thorns, as they stood the watch of life together. The Sun was shining, life was full of thorns. The account was still open." Thus wrote Brenner, epitomizing in many ways the nearly impossible life of the generation of the Second Aliya. 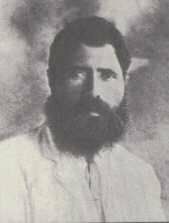 Yosef Haim Brenner was murdered in a massacre by Arab rioters in Yaffo on May 2, 1921. Kibbutz Givat Brenner is named for him, as well as many streets. This is a very partial bibliography. Many of his short stories and essays are included in the Collected Works, including an important critical essay entitled "Haarahat Azmeinu beshelohset Hakrahim" (a self-evaluation in the three volumes). Most of the writings of Yosef Haim Brenner are available on the Web in Hebrew. Copyright © 2007-2008 by the author and Zionism-Israel.com. All rights reserved. This material may not be reproduced in any printed or electronic form without express permission of the author.